Teymouri, A., Ahmadi, A., Mansour, S. (2017). A Novel Two-Stage Mathematical Model for Green Supplier Development. 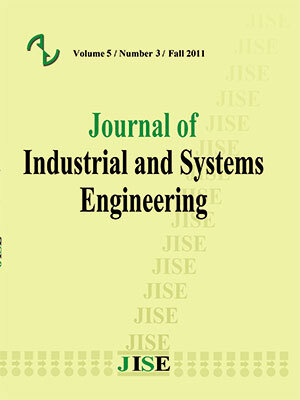 Journal of Industrial and Systems Engineering, 10(Issue 1), 69-90. Atoosa Teymouri; Abbas Ahmadi; Saeid Mansour. "A Novel Two-Stage Mathematical Model for Green Supplier Development". Journal of Industrial and Systems Engineering, 10, Issue 1, 2017, 69-90. Teymouri, A., Ahmadi, A., Mansour, S. (2017). 'A Novel Two-Stage Mathematical Model for Green Supplier Development', Journal of Industrial and Systems Engineering, 10(Issue 1), pp. 69-90. Teymouri, A., Ahmadi, A., Mansour, S. A Novel Two-Stage Mathematical Model for Green Supplier Development. Journal of Industrial and Systems Engineering, 2017; 10(Issue 1): 69-90. Nowadays, numerous processes of any supply chain are done by suppliers and consequently they cause a massive amount of pollution released to the nature. Hence, greening the suppliers has become a necessity. Although most of green supplier development programs need high investment, formal optimization models that address this issue are very rare. This paper mainly aims to address this problem by introducing a two-stage mathematical model which can help managers allocate optimal investment in their suppliers. In the first stage, suitable green supplier development programs are selected. Then, a multi-objective optimization model is presented for investing in an appropriate set of green programs, concurrently. Moreover, the conceptual framework presented in this paper provides managerial insight in every step of this process. Also, a comprehensive analysis is done under two scenarios of budget estimation and it has been found that these programs highly influence their required investment, and therefore, they must be considered, simultaneously. Ackermann,T., Garner, K.,Gardiner, A., 1999, Wind power generation in weak grids economic optimisation and power quality simulation, Proceedings of the World Renewable Energy Congress, Perth, Australia, Murdoch University, 18(2), 527–532. Akman, G., 2014, Evaluating suppliers to include green supplier development programs via fuzzy c-means and VIKOR methods, Computers and Industrial Engineering, 2(233), 420-431. Ameli, M., Mansour, S., Ahmadi-Javid, A., 2016, A multi-objective model for selecting design alternatives and end-of-life options under uncertainty: A sustainable approach,Resources, Conservation & Recycling, 109, 123-136. Awasthi, A., Chauhan,S. S., Goyal, S.K., 2010, A fuzzy multi criteria approach for evaluating environmental performance of suppliers, International Journal of Production Economics, 126(2), 370–378. Dou, Y., Zhu, Q., 2013, Evaluating green supplier development programs with a grey-analytical network process-based methodology, European Journal of Operational Research, 233(2), 420-431. Ettehadieh. D., 2011, Cost-benefit analysis of recycling in the United States: Is recycling worth it?, University of Maryland, http://www.english.umd.edu/interpolations/2601. Frondel, M., Horbach, J., Rennings, K., 2007, End-of-pipe or cleaner production? an empirical comparison of environmental innovation decisions across OECD countries, Business Strategy and the Environment, 16(8), 571-584. Fu, X., Zhu, Q., Sarkis, J., 2012, Evaluating green supplier development programs at a telecommunications systems provider, International Journal of Production Economics, 140(1), 357-367. Gerlagh, R., Zwaan, B.V.D., 2006, Options and instruments for a deep cut in CO2 emissions: Carbon Dioxide capture or renewables, taxes or subsidies?, The Energy Journal, 27(3), 25-48. Hammar, H., Lofgren, A.S., 2010, Explaining adoption of end of pipe solutions and clean technologies: Determinants of firms investments for reducing emissions to air in four sectors in Sweden, Energy Policy, 38(7), 3644-3651. Hatcher, G.D., Ijomah, W.L., Windmill, J.F.C., 2011, Design for remanufacturing: a literature review and future research needs, Journal of Cleaner Production, 19(17-18), 2004-2014. Hickle, G.T., 2013, “Moving beyond the patchwork: a review of strategies to promote consistency for extended producer responsibility policy in the U.S., Journal of Cleaner Production, 64, 266-276. Ho, W., Xu, X., Dey, P.K., 2010, Multi-Criteria decision making approaches for supplier evaluation and selection: A literature review, European Journal of Operational Research, 202(1), 16-24. Hosseininasab, A., Ahmadi, A., 2015, Selecting a supplier portfolio with value, development, and risk consideration, European Journal of Operational Research, 245 (1), 146-156. Ignizio, J. P. and Romero, C., 2003, Goal programming, in: Encyclopedia of Information Systems, Vol. 2, Academic Press, San Diego, CA. Jofre, S., Morioka, V., 2005, Waste management of electric and electronic equipment: comparative analysis of end-of-life strategies, Journal of Material Cycles and Waste Management, 7(1), 24-32. Kannan, G., Rajendran, S., Sarkis, J., Murugesan, P., 2015, Multi Criteria Decision Making approaches for Green supplier evaluation and selection: A literature review, Journal of Cleaner Production, 98, 66-83. Kerr, W., Ryan, C., 2001, Eco-efficiency gains from remanufacturing: A case study of photocopier remanufacturing at Fuji Xerox Australia, Journal of Cleaner Production, 9(1), 75–81. Krause, D.R., Handfield, R.B., 1998, An empirical investigation of supplier development: reactive and strategic processes, Journal of Operations Management, 17(1), 39-58. Makarieva, A.M., Gorshkov, V.G., Li, B., 2008, Energy budget of the biosphere and civilization: Rethinking environmental security of global renewable and non-renewable resources, Ecological Complexity, 5(4), 281-288. Mani V., Gunasekaran, A., Papadopoulos, T., Hazen, B., Dubey R., 2016, Supply chain social sustainability for developing nations: Evidence from India, Resources, Conservation & Recycling, 111, 42-52. Noci, G., 1997, Designing ‘Green’ vendor rating systems for the assessment of a supplier’s environmental performance, European Journal of Purchasing & Supply Management, 3(2), 103-114. Saaty, T. L., 1980, The Analytic Hierarchy Process, McGraw-Hill, New York. Saavedra, Y.M.B., Barquet, A.P.B., 2013, Remanufacturing in Brazil: case studies on the automotive sector, Journal of Cleaner Production, 53, 267-276. Sims, E.H.S., Rogner, H.H., Gregory, K., 2003, Carbon emission and mitigation cost comparisons between fossil fuel, nuclear and renewable energy resources for electricity generation, Energy Policy, 31(13), 1315-1326. Sutherland, W.J., Adler, P.D., Haapala, R.K., Kumar, V., 2008, A comparison of manufacturing and remanufacturing energy intensities with application to diesel engine production, CIRP Annals, 57(1), 5-8. Talluri, S., Narasimhan, R., Chung, W., 2010, Manufacturer cooperation in supplier development under risk, European Journal of Operational Research, 207(1), 165- 173.